Beading is a new hobby of mine, I've been doing it quite actively since March this year. I originally just wanted to make Atma Weapon from Final Fantasy VI but I got so addicted to beading I just couldn't stop. It's sort of a meditation, it really calms you down. Now, Atma Weapon was an enormous thing to bead, so when I finally finished it---everything else I made was piece of cake. The original sprite of Atma Weapon from Final Fantasy VI by Squaresoft, released in 1994 for the Super Nintendo. 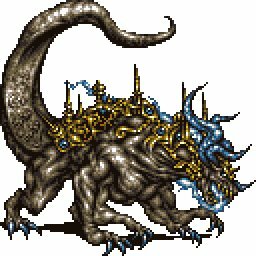 Been my favorite 2D Final Fantasy-boss ever since. Felt good to use another set of colors, you could already feel how it was growing. This was from when I got back from my second visit at Panduro having purchased more pegboards and some brown, gold and bronce beads. Now it was really taking shape. Finished the body in broad daylight a saturday and the tail in the late afternoon. After a few days pause I finally did the last of his back and the upper tail. All finished and ready for some ironing! Heavy David-bibles in the form of Absolute Sandman helped avoid the heated beads from bending upwards. My gray 'frame' is rougly below a thousand beads. Crazy.